Bishmore Consulting needed an easy to use website that would be able to offer their services in a professional manner. 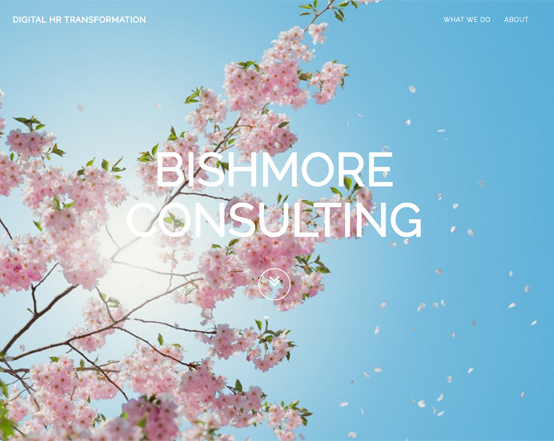 Bishmore Consulting are consulting business that specialises in the delivery of end-to-end Digital HR Transformation. The objective for this website was fairly simple, a one page design that would introduce users to the business and services. It would need to be able to work on all devices and be easy to edit and update on a regular basis. After a couple of meetings with Bishmore Consulting, we started work on the design and development of the website. We created it on our Timberwolf CMS, so that it was responsive and easy to update.As they wanted a one page design , we decided to create it as a parralax design, which allows for a smooth transition between sections on the page. We made the design quite colourful with an overall professional feel to it to represent the business.The design allows for users to easily access different sections of the website.